Each service at Viola Enterprises is spearheaded by Henry Viola, The Ethical Entrepreneur, who is supported by a number of partner associates who bring in specialist expertise when required. These associates are focused on bringing in extra resources to projects, including accounting, marketing and IT expertise. Due to the time intensive nature of the work provided, only a limited number of contracts are accepted each year, subject to time and resource requirements. Many of our projects run for several months, and all contracts are fully planned and agreed with the client before work begins. Our mission is to provide a quick and cost-effective management and operations consulting service for SMEs around the Oxfordshire area, combining high-quality academic knowledge with a no-nonsense approach to providing advice to strategic decision makers. We provide company and policy makers with a thirty day examination of their business, culminating in a report to deliver tangible improvements to their business. Our process breaks down into several stages where we examine your business, your team and processes, and then deliver our findings in a succinct and easy to action formula. Viola Enterprises has a reputation for credibility and integrity; a reputation grounded in the values of rigorous analysis, hard work and focus upon results. We’ve worked hard to make sure that our clients see the value that we create, and that they’re confident enough in our findings to make the changes to their businesses that we identify as part of our research. If you have a performance issue with your business, whether it is about external competition or internal processes, we challenge ourselves to provide a compelling answer. Please call today on 0772 3475708 to talk to discuss your situation or email us at enquiries@violaenterprises.co.uk with more information about your needs. 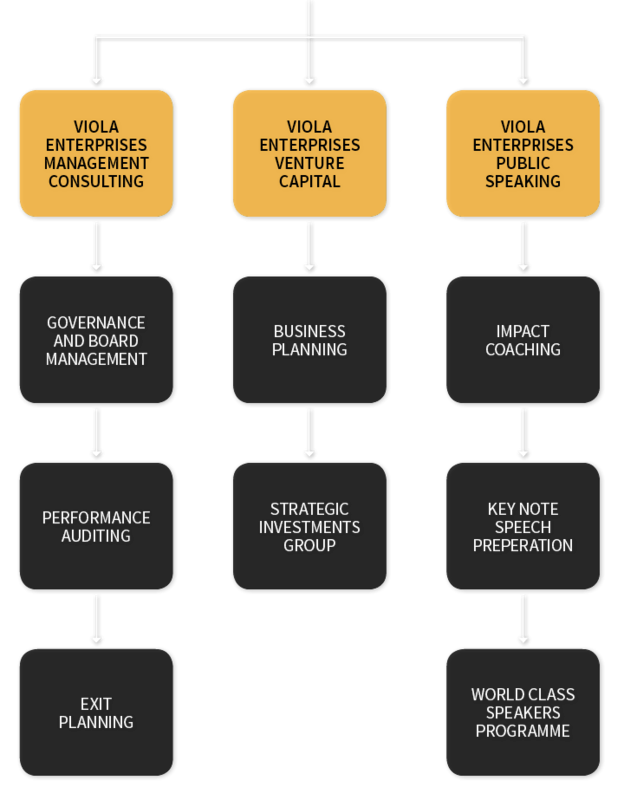 Viola Enterprises works with businesses to help address the fundamental challenges of the business world: how to sell, who to sell to, and at what price. We believe in providing the benefits of value creation by being selective and distinctive when taking risks. Not only do we look at how to create value for our clients, but we also look at how value is measured, changing the ways performance is measured and managed. In all cases, we help companies to address specific issues that have a tangible impact on company value, including resetting corporate strategy, reshaping their portfolio, addressing underperforming businesses, assessing investments in new markets, prioritizing growth opportunities and rethinking pricing strategies. Engaging with our client’s management before they enter a new market to clarify expectations and capabilities. Evaluating the governance structure and the optimal corporate formation for operational control. Putting into place market-focused business plans that facilitate a rapid entry into the chosen market. Developing key business partners and board talent. Assisting in the preparation and presentation of funding documentation. Based on our experience and study of what distinguishes successful businesses from the rest, we believe the ability to get the right actions done quickly and effectively is the key to sustainable performance. At Viola Enterprises, we will work with you to deliver a plan which encompasses the processes and metrics to deliver results results and capabilities – never one without the other. Without the emphasis on capabilities, future results will be uncertain. Through our collaborative work, our goal is to bring practices, standards, and tools that make for stronger management teams and organizations that last well beyond the results that we help our clients achieve today. Making the focus on value a mindset that is accessible and readily understood across the entire team. People who start their own businesses tend to be focused and driven for success, and yet statistics show that failure rates in the small business sector have been consistently poor since records began. Even out of those that survive, few go on to achieve their full potential, and here at Viola Enterprises we believe we know why. Start-ups need to be clear about their path forward in an uncertain world, but unless the founder is a serial entrepreneur, thy’re missing the skills to know how to go about doing this. Back in 2013, we began process of developing a solution to this need. We wanted to create a business planning service which was engaging, effective and affordable. It was easy to write, but the solution was complex, with the problem being that in today’s world, good advice can be expensive. So, to be affordable, our service aims for a quick turnaround of your plan to keep costs to a minimum. When engage Viola Enterprises to help you design and write your plan, we make a pledge that your final bill will be no more than £250, and that your plan will be completed to your satisfaction within two weeks. Convincing lenders and investors that you are in control of the project and that not only will their money be safe with you, but that you can generate a return for them. Helping you to logically think through your idea, anticipate any potential difficulties.and consider all options available to you. Here at Viola Enterprises, we excel in helping you to find the way forward for your business. Through a series of intensive Q&A sessions, we design a bespoke business plan to fit your needs and make sure your business is moving forward on a steady footing. We excel at providing relevant, focused plans to our clients and can help you to identify issues before they become on-going concerns. Our planning service is designed to produce a professional, bespoke business plan which is written with you, with your goals in mind. Face to face meetings will help us to understand your needs, and we can provide detailed, and actionable advice on any extra research you need to carry out. Viability checks and strategic development are part of our focus, along with a compelling narrative, financial stress testing and where possible, a visual representation of relevant facts. We recognize that not all business owners and entrepreneurs are looking to write a business plan for the same reasons, but that every business does need one. Whether 5 minutes old, or 5 years, don’t leave your operations to chance – contact us today to find out how Viola Enterprises can help you! WHAT IS THE STRATEGIC INVESTMENTS GROUP? The Viola Enterprises Strategic Investments Group is dedicated to sourcing relevant and proprietary deals for our business, where we can add value and generate increased revenue through our expertise. Once an investment opportunity has been sourced, our advisory board reviews proposals before contacting the company concerned in order to make an informed and independent decision about whether to move ahead with the proposal. We are continuously seeking out new opportunities from our client and associate network, and will only pursue those opportunities where we feel we can add unique and genuine value to the proposition. Having worked with a wide range of start-ups in many different industries and sectors, we live to encourage the spirit of invention and innovation that fills the entrepreneurs of today’s markets. We look to identify new companies who are developing ground-breaking products, and are looking to transform lives by doing so. Viola Enterprises looks to provide start-ups with the capital they need to grow, filling the the gap between ‘Friends and Family’ loans and investment from VC firms and banks. We welcome all proposals, from phone calls, to one page summaries, to complete business plans, and naturally sign NDAs as requested. We endeavour to reply to all correspondence which is sent to us, even if we do not intend to invest, and often request further information or a face-to-face meeting to find out more about you, your team and your business. Based in Oxford, our public speaking team are here to give you maximum confidence no matter what your skills or abilities. All of our team have been trained through Toastmasters International, a world famous Public Speaking and Leadership Development organisation with more than 14,500 clubs around the world. Being based in the city gives our team full flexibility to deliver content right across Oxfordshire and the surrounding counties. From giving business presentations, to delivering key note speeches, and holding position as Area Governor (Oxfordshire) for Toastmasters International, our lead coach has a breadth of experience in public speaking. We understand the fears of a first time speaker and can work closely with you to maximise your potential in any public speaking arena. Public Speaking skills aren’t just needed for standing behind a podium and talking at a room full of people – they’re an essential tool needed in almost every social situation, and as a speaker, your listeners will be judging almost your every move; how you smile, how you hold yourself, the tone and speed of your voice, even your appearance – and that’s before we even get to the content of what you’re saying! Public Speaking is all about presentation, charisma and influence. The ability to deliver an effective speech, whether for a business meeting, a debate, an interview or a family function like a wedding or a funeral is a important life skill – but one one which terrifies most people. If you fail to impress on too many of these factors, you will quickly lose the interest and respect of your listeners, but if you can get the right balance between good content and good presentation – you will inspire, engage and create interest in your audience, leaving a positive and long-lasting memory which can cause great waves of action amongst the people who heard you speak. If you’re concerned about an upcoming event, or simply want to develop your confidence for the next big public speaking encounter, Viola Enterprises Public Speaking Coaching is the place for you. HOW CAN VIOLA ENTERPRISES HELP IMPROVE MY PUBLIC SPEAKING? We recommend that each coaching session is planned in advance and these sessions can take place at your home, your office, or any convenient location. You can decide how many sessions you need depending on your progress and confidence. Despite the fears of so many people, we have never viewed public speaking engagements as anything more than a conversation. By taking up one of our training packages, you are taking apositive step to find your voice and get your message across! To find out more about how Viola Enterprises can help serve your public speaking requirements call 07723 475 708 to speak to one of our coaches and get your personalised training plan!